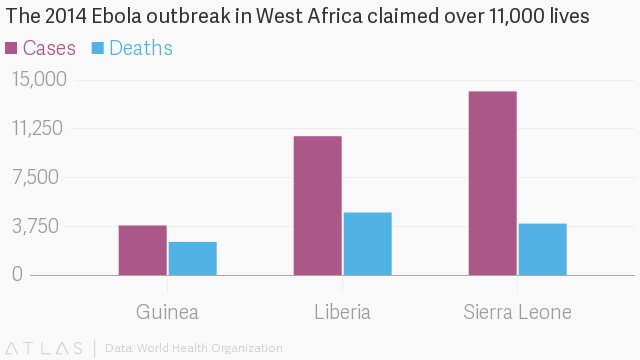 Remember the great Ebola crisis of 2014? A devastating outbreak in West Africa caused worldwide panic, and it took health workers two years of sustained effort to contain the epidemic. The good news is that an Ebola vaccine created by the crisis works, and it looks like it’s still working two years later, meaning it could give long-lasting protection against one of the world’s deadliest diseases. Hopefully, science can make Ebola a distant, unpleasant memory—permanently. The Outbreak: The biggest Ebola epidemic in history began quietly in 2013 and spread through Guinea, Sierra Leone, and Liberia in late 2014. The outbreak would ultimately killed 11,000 people and leave 17,000 survivors with severe damage, a mortality rate of 40%. In some places, mortality was recorded at 70% or more. There is no cure, and treatment is limited to hydration, rest, and oxygen. Why It’s Hard to Beat: Ebola virus spreads very slowly, through direct contact with bodily fluids, but it’s also hard to spot: infected people can feel fine for a week or more before showing symptoms. This makes it hard to quarantine, especially in places with poor sanitation, even though it moves at glacial speed compared to things like the flu. And because it’s so deadly, it’s also harder to find health workers willing to help treat patients, so containment is even more challenging. Fast, Effective, Durable: Because Ebola virus is deadly and incurable, stopping new infections is the only way to save lives, and immunity is the best way to prevent infections. A promising Ebola vaccine developed in Canada was put into clinical trials, both in Europe and Africa, in part to help contain a flare up in Guinea. Those trials showed it worked quickly and was nearly 100% effective. The evidence was strong enough to stockpile 300,000 doses, even though it has yet to be officially approved by drug regulators. Even better, a new study in The Lancet showed that Ebola antibodies were still present in people’s bodies two years after receiving the vaccine, which is great news for places where it’s hard to distribute booster shots. Merck hopes to finally get FDA approval later this year. Related Video: Could Growing Vaccines in Plants Save Lives?